A few weeks ago I got the chance to speak to the man behind Big the Cat’s theme song and Sonic Rivals’s main theme song ‘Race to Win’ Ted Poley. See how it went! 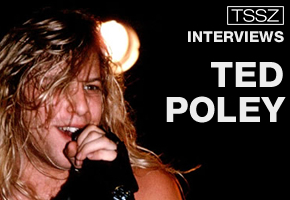 Ted Poley is the talented musician who helped compose and write such Sonic music favourites as ‘Big the Cat’s’ theme ‘Lazy Day’s’ and ‘Escape from the City’. I caught up with him the other week to quiz him on life while working with SEGA and Jun Senoue. I also managed to clear up a couple of rumours regarding Ted and the Sonic community while I was at it. What for you important in life? A good career or to live unique? Or something really different? How would you describe your music style? Is there any style you really do not want to be compared to? I can’t honestly say there is a style. I am too close to the music to be a judge I think. In general I like to think I appeal to people with sense of melody, with a sense of good music and chords. I always like to have great rock beats and drumming but I couldn’t put a style tag on the music. I have a consistant style, I do what I do, and hopefully people will like it. Has working in the games industry taught you anything about how to write music in general? I can’t say it has helped. I would say it’s different and it is definitaly a skill. Basically it’s music ‘on-demand’ and too specification. In the old days I probably wasnt up to the level of doing it. Your job is to follow the original style and theme to bring the game to life. You have a set of blue prints that you have to use to please the games company. So I can say I have learnt how to do that. Music in games is getting bigger all the time. Have you noticed any changes in companies’ attitudes towards game composers and people in the audio processing business? I think now with the success of games like Guitar Hero there has been a change in the attitudes. The focus is really on the music a lot more. Normally the music is just confined to the user playing it, but in places like Japan the music makes it onto audio CD. The music is standing more on its own these days. What I found great about the music standing on its own is that people hear my music in the game, they then go out and find my personal music and start listening to that as well. I have to thank the video game world for a lot of my fans, especially the younger fans. I really enjoy it all. You had such an illustrious 80’s metal career, how did you get into working on Sonic Adventure? Ah, Big the Cat, that was fun! It was all opened up by my good personal friend Jun Senoue from Crush 40. Jun intiated the contact and invited me to help out with the SEGA team and produce some music. He probably contacted me after hearing my ‘Danger Danger’ stuff. Have you ever played or watched the Sonic-Games where you’ve been featured? Actually, the only time I have seen the game in action is when I have to sign a lot of confidentiality paper work and SEGA send me a video of the game in action for inspiration use. So I have seen the charaters, the graphics, and gameplay. Other than that I saw my friend’s kids playing the game when I went round to visit. Apprantly, you worked with Jun Senoue at the start of the year? What was this for? I did, I don’t think I can say what the game is. It’s probably a hand held… All I can say is there is something coming. It’s probably not a Sonic game, I believe it’s sports related. Can you remember how long it takes to work on the tracks with Jun Senoue? By the time I have gotten the track a lot of the music is already created. The concept is already there and normally a title is provided with a demo. I then come up with the lyrics sticking to Jun’s concept and title. Sometimes I will then add the melody and lots of harmony parts. I like adding the singing and harmonising parts that’s fun to do, and a challenge to stick to Jun’s ideas. A length of time… funnily enough one of the Sonic tracks took only two days! This was another of my questions actually. There was a rumor going around that the Sonic Rivals 2 Main Theme song took just two days to produce? Yea, that’s the one! They needed a track really quickly. We started from scratch! It had to be writen, recorded and handed in within two/three days. It worked well because I had to concentrate on the music and not think about anything else. It helped because I didn’t have all the worries about things like ‘will everyone enjoy this’. It was an experient that could have gone wrong. However, ended up working and working really well! Normally though two days is not the standard length of time. But the video games industry does not move slowly so these tracks to get produced quickly, generally two weeks I would say. On your MySpace there is a song called Takoyaki Rock that reminds me of the video game work you have done in the past. Did you by any chance make this with Jun Senoue? I did work with the SEGA guys on this one! I was inspired by the food Takoyaki when I was over there and the ‘SEGA All Stars’ helped me record it. ‘SEGA All Stars’ is what I like to call Jun and the crazy, talented guys who do the music over at SEGA. They had about 10 minutes left in the studio when Jun showed them my track. They then learnt and recorded it in the little time they had left, all in one take! The end result is a rocking track which sounds great. Funnily enough, it sounds like the video game music because of the ‘All Stars’ that worked on it for me. I think Jun is going to include it on one of his CD’s and I am going to add to my next greatest hits track. I think the video game fans will really like this track. How did this track come to being created? I ate a lot of Takoyaki when I was in Osaka. With all respect, I just thought it was a fun word and a great food. So I made this track and Jun helped me out with it. You said on Jun Senoue’s community forum that you would love to tour Japan with him. Is this something that is possible? We have talked about it and I would love to go on tour with Jun. Playing live with the ‘SEGA All-Stars’ is a dream! I would really enjoy bringing the fans favourite music into a live arena and bringing them too life for them. Do your fans ever talk to you about your works with SEGA and Jun Senoue? Oh yea! Especially my older fans who have heard my voice on their kid’s games console. They then come down to the shows and mention that to me. I also get fans who have never heard of ‘Danger Danger’ who come down to see me just from listening to the music from the Sonic games. How critical is Jun Senoue during the process of producing video games music? Oh, Jun is the team captain, he’s in charge. He is the most important person. He is the conduit to the whole process and without Jun and his work ethic the tracks wouldn’t sound like they do. To me Jun is just a really nice guy and a friend. It’s hard to think of him as this genius musician who is so in touch with the scene. Without Jun however I would not have been introduced to this whole world. So I have a lot to thank him for. Have you ever heard of the event called ‘Summer of Sonic’? I can’t say I have, please enlighten me! Oh! I wish I had known! That’s so great that all the guest like Richard Jacques could go down. If there’s anything I could ever do for these sorts of things I would love too! I’m not the top A-list musician so I don’t have my private jet or anything. But if it was logisitcally possible I would love to get involved! Brilliant! Thanks for talking to me Ted and good luck with the future! Well there you have it! The man behind some of our favourite tracks laid out. Rumours cleared up and even a bit of excitment at the prospect of hearing Ted and Jun together in a new game. Wonder what game it could be? Ted is always updating his MySpace with what gigs he is doing. So check that out if you want to go see him. He also sells CD’s of his work through his website. Just announced is Ted’s ‘Greatest Hits vol. 1’ be sure the have a look at that. He told me to say that if anyone wants to buy a CD and have it signed he would be more than happy to do so. Just email him at TEDPOLEY1@aol.com. Sang and co-wrote the Team Sonic theme, ‘We Can’, from Sonic Heroes. Worked with Jun Senoue on the composition and production of the Sonic Rivals 2 theme, ‘Race to Win’.